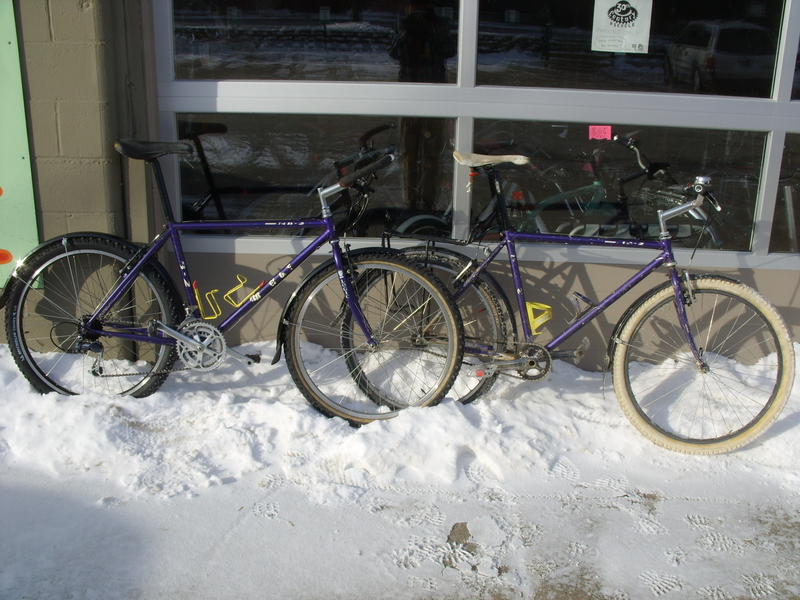 It has been a loooong week, but not time wise – we had 2 Surly looongtail bikes come through the shop! 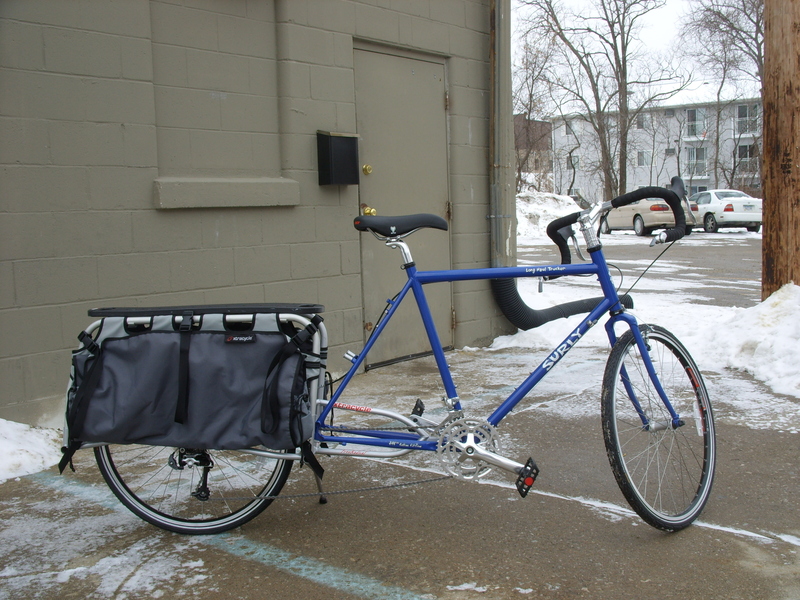 First, we built up this Long Haul Trucker with Xtracycle FreeRadical. This bike is for another car free liver here in Iowa City and is going to see daily duty so watch out for it. This FreeRad has the new bags, which are glowingly reviewed here, on another Long Haul Trucker X. 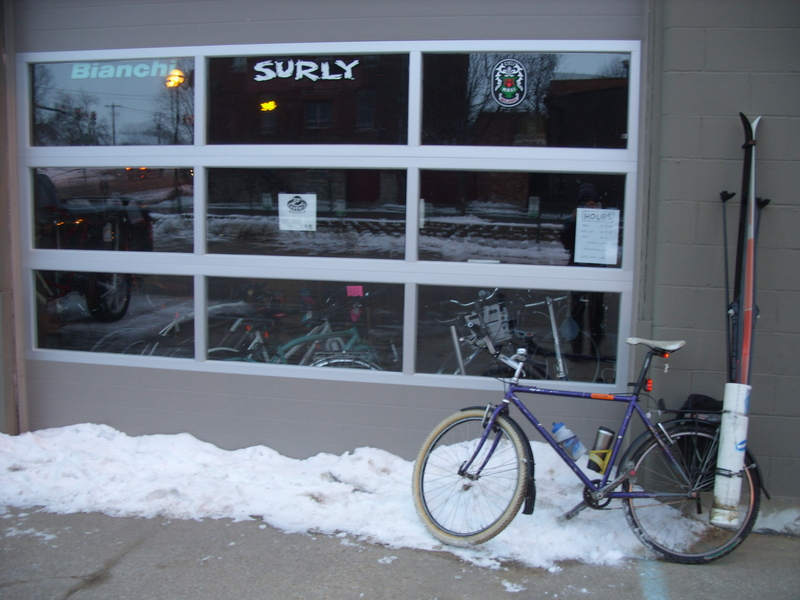 We also had our first in-person look at the redesigned Surly Big Dummy. The new owner was so excited to get it out in the world that we did not even get to take a picture of it, so you will have to make do with this photo. It looked just like that, except it was here, and it had Planet Bike Cascadia fenders, a nice set of lights, and water bottle cages on it. The Big Dummy is an incredible bike, and Surly’s smart redesign changed out components to ensure it still has it where it counts for a heavy hauler, but took $800 off the previous msrp. It’s not just a deal, it’s more than a steal, it’s like legal Grand Theft Bicycle! 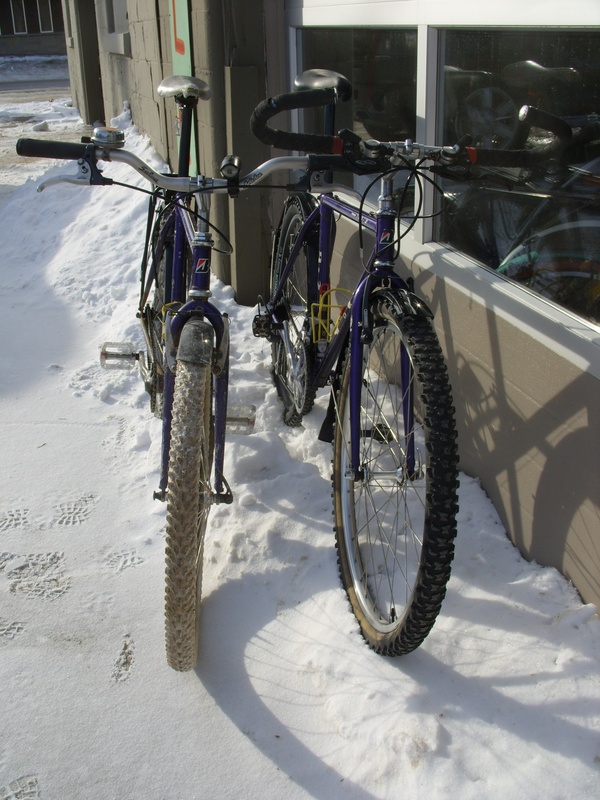 To atone for the missing Big Dummy pic, we offer this humble shot of the Bridgestone MB-2, again, now with ski hauling super-tube on it. The tube is just a scrap piece of evil pvc (sorry world) with a cap on the bottom, attached to the rack with massive hose clamps. It is the easy and car free way to get to our local nordic ski options. You can go to Ashton, or out to Squire Point, or even up to McBride if you are feeling really ambitious. Called the super-tube because when not carrying skis it handily carries other things, like cans of soup. See ya ’round the bike rack! You might remember that Steve’s story about how much he likes his Bridgestone MB-2? So he was pretty excited was he to have another come through the shop for a makeover! A size smaller, but that same purple, same chipped off decals, and same Ritchey Force quill stem. More original parts for sure, it still has the Specialized crank, the Deore thumbshifters, the 7sp Deore DX hubs too, and that might even be the original saddle? Two great bikes that look great together! Last I knew there was a beautiful one for sale in the On One basement, could be worth a trip if you are looking for a bike buying pilgrimage. And if you find it, and it fits, and you buy it, then you can join our local Bridgestone Owners Bunch. This is one of my favorite seasons to ride a bicycle, which is really just one out of four, but as this little two-panel comic can attest, I don’t always stay upright. I drew this about three years ago in similar conditions: Beware those chunks of ice hidden below powdery snow! Where Are You Go – Where Are You? This is such a great video, but there is no info on how to get a full length copy or when they might be available. Oh well, when we can find it we will put it in our library! Posted by 30thcentury under Activism, Handbuilt Wheels, MASI, Media Blitz! We open for 2011 business today at 11am! We had a nice couple of weeks off, we needed that. While we were away you might have noticed that Steve’s bike was on the cover of Little Village, and that we were interviewed inside? Truly the best and easiest way to find a parking spot. Bonus: no parking ticket, no worry, no running, no meter, and no ramp. And while we’re at it: no gas, insurance, pollution, etc. You can take the money you save and spend it at downtown businesses so they have more money for their Park and Shop program and can help more motorists by subsidizing their insatiable parking needs. So if you want to talk about issues or get your copy of Little Village signed, come and see us! 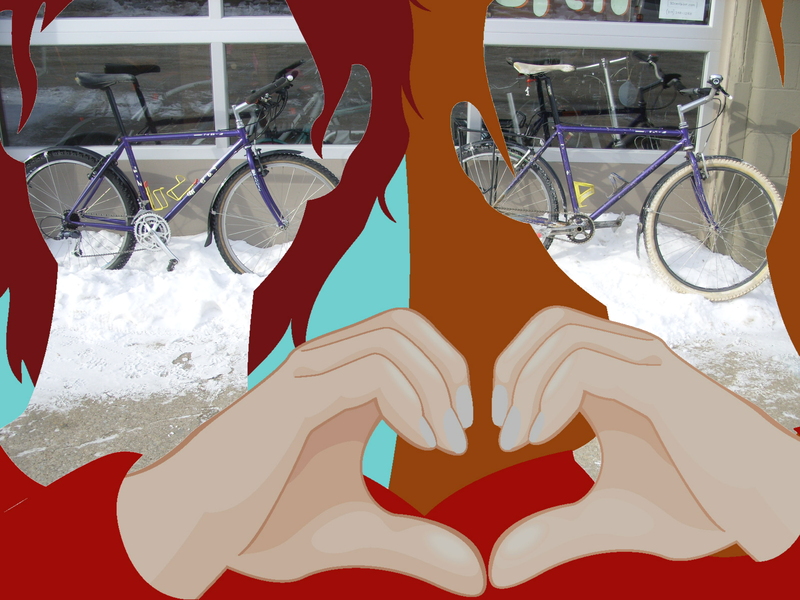 And if you need bike stuff or repair of course we can do that, too.